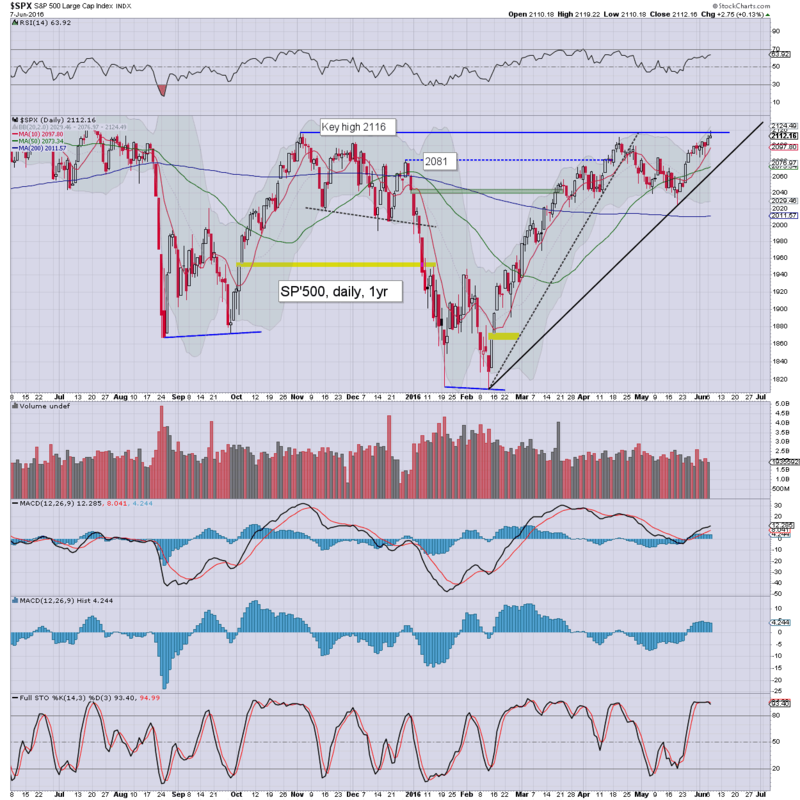 US equities closed moderately mixed, sp +2pts @ 2112 (intra high 2119). The two leaders - Trans/R2K, settled higher by 1.1% and 0.2% respectively. 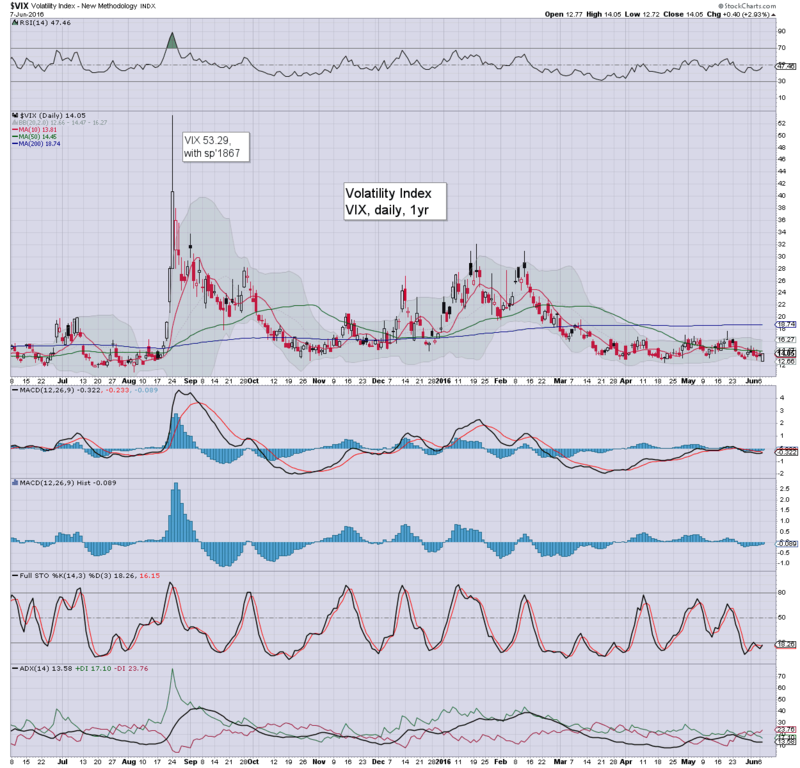 The VIX settled +2.9% @ 14.05. Near term outlook remains extremely borderline, as the market is on the edge of a major bullish breakout.. or the third epic fail since summer 2015. Today provoked a few flash backs to the algo-bot upside melt of 2013. 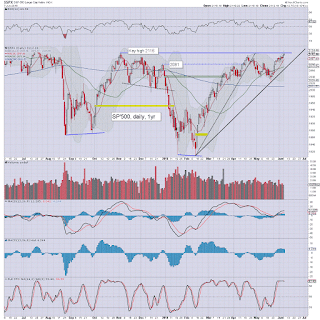 Equity bulls had a new multi-month high of sp'2119 to tout - a mere 15pts (0.7%) from the May 2015 high. Although it remains notable that most other indexes are still significantly below their historic highs. 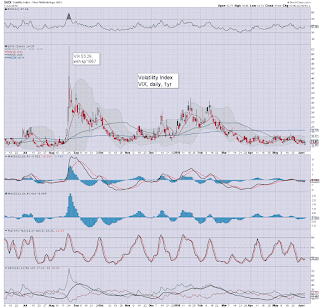 Volatility remains bizarrely subdued in the low teens. A move to at least briefly test the key 20 threshold looks highly probable this month, especially around the time of the next FOMC (June 15th), and the BREXIT vote (June 23rd). 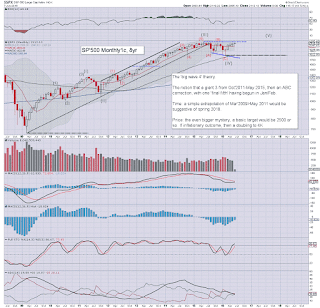 Effectively... if Jan/Feb' saw a C' wave complete.. we're soon to break up and away. Upside price target would be somewhere in the 2300/2500 zone (at min). However, an issue that is usually overlooked is the aspect of time. 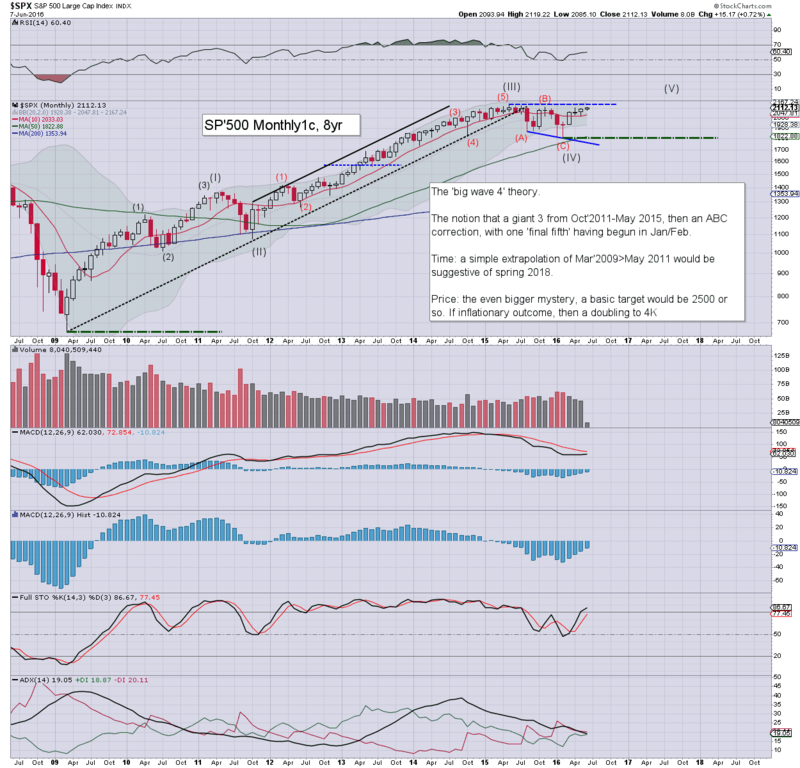 If sp >2134 this summer... then at minimum, I would be seeking broader upside into spring 2017. However, based on the fact that wave'1 - March 2009-May 2011, spanned a full two years, if you simply extrapolate that from the recent lows.. that is more suggestive of upside into 2018...a clear 18 months. 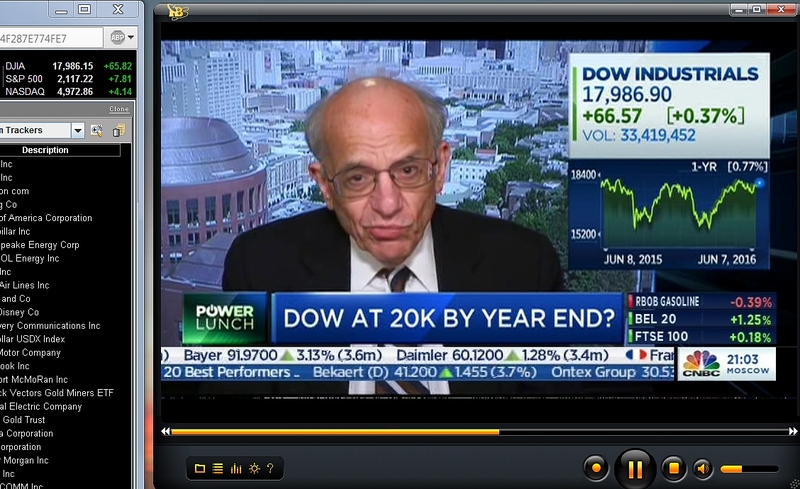 Talk of Dow 20K has resumed on clown finance TV. 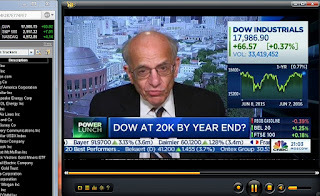 The one thing that Prof' Siegel is concerned about is if earnings fail to improve, current equity levels are arguably pricey. I would agree there are a truck load of threats to the market right now, but the market will do what it will do. There is no point fighting it, and if June closes broadly in favour of the bulls, then those bears who can't stomach being long should merely go into early hibernation... for a very considerable time.